The ceremonial “cake cutting” is an important part of any traditional wedding reception; not only does it create a sweet moment for your photographer to capture, but it’s also a chance for you and your spouse to shove cake in each other’s faces (or not)! And of course, your guests will also be enjoying the cake as part of their dessert, so you want to make sure it tastes as good as it looks. Still, with so many options to choose from when it comes to selecting your wedding cake, how will you know where to start? We have some tips to make the process easier on you. The best time to start planning your wedding cake is after you’ve completed your guest list, but long before you’ve gotten all of your RSVPs. This way, you know the maximum number of people who will attend your wedding, and you can plan accordingly. For an average-sized wedding of 50-100 guests, you’ll generally need a three-tier cake, whereas a guest count of 200 or more will probably require a five-tier option. As you meet with each specific bakery, however, they should be able to give you a more accurate idea of how much you’ll need. A pretty cake will photograph well, but remember that your guests are going to be eating the cake at some point—so of course you want it to taste amazing! This is why it’s highly recommended that you schedule several tastings with different area bakeries; most will provide you with a complimentary (or inexpensive) tasting of some of their most popular flavours. This way, you can get a better idea of not only how their cakes might look, but how they’ll taste as well. If you’re going to attend multiple tastings, try spacing them out over the course of a few days (especially if you don’t have much of a sweet tooth)! Also, be sure to get a price quote along with contact information from each bakery. Today’s bakeries can do some pretty amazing work when it comes to cake design, so don’t hesitate to share your vision for your wedding; there’s a good chance that a talented baker will be able to come up with a beautiful cake design that suits your specific theme! For example, if you’re going for a rustic theme (which is very popular these days), your baker may be able to use fondant to create the appearance of a burlap-wrapped cake or something similar. The possibilities are truly endless here! For many couples on a budget, justifying spending several hundred dollars (or more) on a cake isn’t easy. This is where it can be useful to determine a budget you’re comfortable with ahead of time and price out your options before you attend a tasting. If you’re up-front with a bakery about your budget ahead of time, they will be able to tell you whether they can work with your budget (and most will be able to). Generally, the price of a wedding cake is around a couple dollars per person, but this can really vary based on the level of intricate detail you want with the cake design itself. If you’re on a tight budget, there are options to consider that will save you money. For example, rather than having a several-tiered cake to serve 100+ guests, why not order one small topper cake for your ceremonial cake cutting, in addition to a couple of large sheet cakes that can be used to feed your guests? This way, you still get to enjoy having a pretty cake for your cutting, and your guests can enjoy some delicious cake without you having to break the bank. Speaking of cost, it’s also important to find out exactly what will be included in your price quote from the bakery. More than likely, your quote will include the cost of the cake in addition to sales tax. However, if you want to have the cake delivered and set up for you, there may be additional charges that apply. For some bakeries that deliver, there may even be a travel cost tacked onto the delivery fee. Plus, you may want to tip your delivery/set-up person, so these are all additional expenses worth keeping in mind. When it comes to frosting options for your cake, there are two popular choices to consider, buttercream and fondant. Buttercream is definitely the more delicious choice out of the two, but it has some limitations when it comes to decorating. Fondant, on the other hand, is super smooth and great for decorating, but it doesn’t really have much of a flavour. As you decide which frosting option is right for you, be sure to consider the potential pros and cons of each. Many people these days choose to do a layer of buttercream topped with a thin layer of fondant that can be removed before eating. If you have any gluten sensitivities in your guest list, it would probably be greatly appreciated if you offered up a gluten free cake option. While it’s certainly not something you have to do, ordering a separate, small cake for those with gluten sensitivities would be a nice gesture. 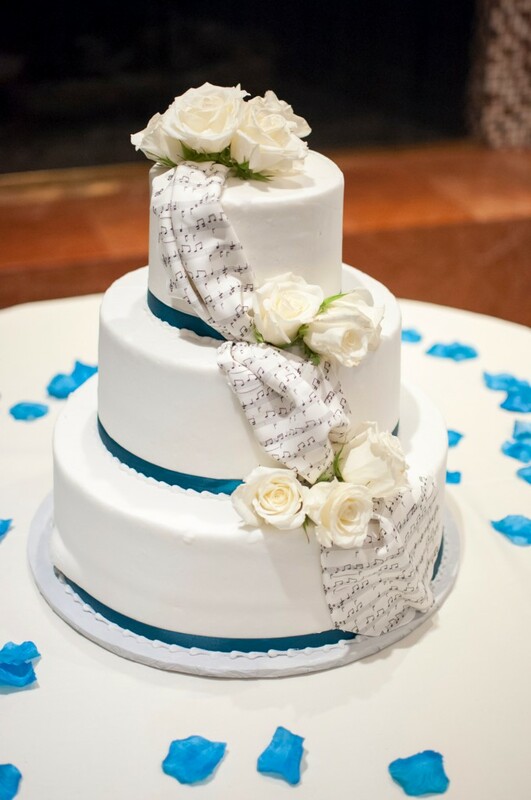 Last but not least, don’t assume your bakery will include your cake topper of any cake trays/serving utensils as part of your order (unless you already have it in writing). These are additional accessories that you will need to purchase for your special day. As you can see, there are many considerations to keep in mind while shopping for your wedding cake. On the bright side, you’ll at least get to taste some delicious desserts with your soon-to-be-spouse throughout the cake shopping process, so it’s not so bad, is it?